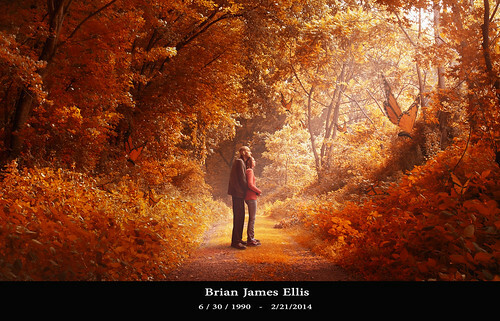 In Memory - Brian James Ellis "Serenity"
and it’s quite possibly the most meaningful photo I’ve ever made. The subjects of this photo are my friends Brian and Ashley. Brian passed away six days ago after a nearly five year long battle with Osteosarcoma (Bone Cancer). Brian’s battle with cancer was a turbulent and exhausting one. Soon after being diagnosed with Osteosarcoma Brian was forced to have his leg amputated. After the amputation and intensive chemotherapy, Brian’s cancer was thought to be in remission. He was on top of the world after finding out the news and Brian chose to finally pursue his passion of art and photography by enrolling into a highly selective art program at a nearby university. Sadly, not long after starting school he had to leave to restart chemotherapy and other forms of treatment to fight the reoccurring cancer. Everyone that knew Brian admired his courage and desire to live even when faced with a truly aggressive form of cancer. Though there were many times Brian had very little energy and had difficulty breathing, he still found the strength to pick up his trusty Nikon DSLR and go outside to photograph things with me.